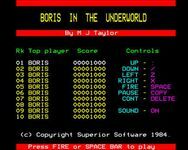 Boris in the Underworld is a simple shooter. Boris can move orthogonally anywhere within the walls, shooting in the direction of travel. The walls close in as time goes on, and contact with the wall is fatal for Boris.